This is an excellent DC- DC Converter Module that can adjust the output voltage to any desired value, even fractions from 0 V to 17 V. It is a very good Variable Power supply Module. But pressing the switch we can adjust the output voltage. It can handle a Peak current of 3 Amps. 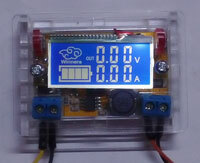 The output voltage and current are displayed in an LCD Screen that has back light. If the input voltage is from a Battery, the LCD display shows the Battery Level also. Input voltage can be between 5V and 23 V but the best voltage is 20 V. It has 95% conversion efficiency and 1% LCD accuracy. It is available with a transparent casing. You can fix it in the case provided along with the Module.It can be connected to the Bread board so that we can determine the current consumed by the project. Its cost is just Rs.350.